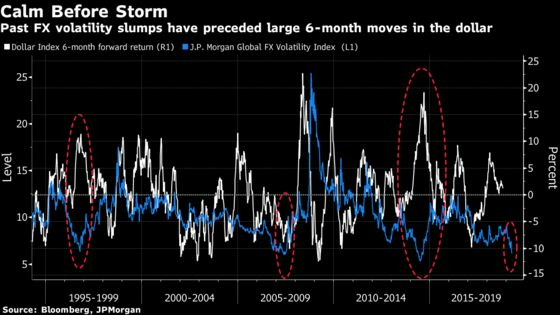 (Bloomberg) -- Currency traders should brace for a large move in the dollar, if past periods of low volatility are a guide. The Dollar Index has risen about 0.9 percent this year, compared to a 4.4 percent gain in 2018 and a 9.9 percent drop the previous year. The U.S. currency has strengthened against half of its Group-of-10 peers and weakened against the other half.